This 92 Year-Old Speed Walker is Still Breaking Records…Her Own! I grow weary of people changing their active lives simply because the calendar says they are older. What we do with our lives is largely a function of what we expect to do. 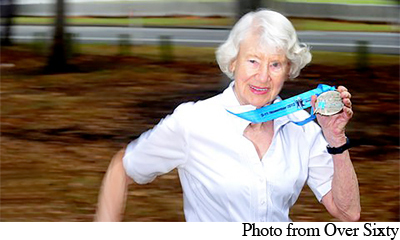 Meet Heather Lee, Australia’s fastest 92 year old woman speed walker. She holds five world records and eight Australian records for race walking. Does she plan on slowing down? Heck no, she plans to break her own records in 2019. I love it! Although she no longer drives, she walked over 3 million steps last year. She averages about 10,000 steps a day. She trains three days a week and has a race walking coach, herself fifty-five years old. Her coach says she is the only person she knows who can keep up with Heather. Heather has had an interesting life. She was born in the UK and moved to Australia with her daughter after the failure of her first marriage. Two years later she married her second husband and says they lived an idyllic life near the sea. Always focused on wellness and fitness, she kept herself in shape swimming, biking and playing tennis. It wasn’t until the death of her second husband in 1996 that she began to focus more on athletics. He challenged her before he died that “now is the time for you to show your meddle.” She began to focus on walking, faster and faster. It became part of her mental therapy, the faster she walked, the better she felt. Heather did not begin to compete seriously until she was 85! She currently holds world records in the 90-94 age group in the 3k, 5k and 10k speed walking events. Although there are limited competitors, she focuses on competing against herself. Her goals are to always try to beat her own times. Thank you Heather for being such an inspiration. I believe each of us can be, and do, more than our current efforts, and do it with the same optimism and determination.